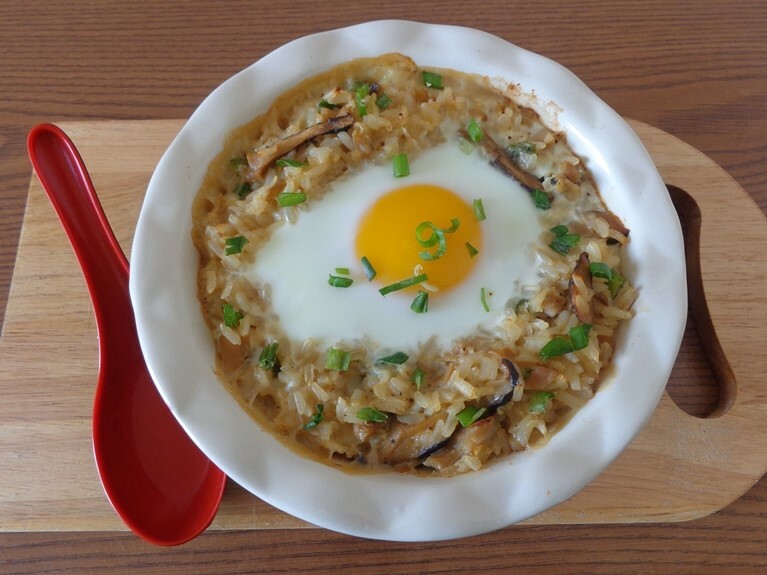 Check out this delicious Baked Clam Miso Risotto recipe from VeeTee member Hidemi Walsh and the story behind it: In Japan, there is Ojiya which is like porridge. This is also called “Hangover food” and one of my father’s favorite (he passed away last year). He was a rice man and happy as long as you got rice and miso soup for any meals. His favorite was clam miso soup. I created this recipe thinking about him. We don’t bake ojiya but this is my twist. Also I added unsweetened almond milk which brings out nice nutty flavor and matches with miso. To make it tastier, I added clam juice to my risotto. 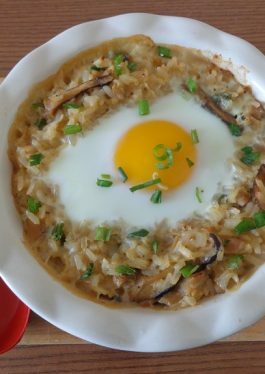 When you eat, break the egg yolk and stir with the risotto so that you would enjoy gooey creamy egg yolk and umami packed risotto together. 1. Separate the clam and juice in the can (you should get total 1 cup of clam juice but if not add water to make it 1 cup). 2. Peel and mince garlic cloves. Remove stem of shiitake mushrooms and chop stems. Slice shiitake mushrooms thinly. In a small bowl or cup, whisk together miso and almond milk (you don’t need to dissolve miso completely at this point). 3. In a saucepan, melt butter over medium heat. Add garlic and cook stirring constantly until lightly browned. Add shiitake mushrooms with chopped stems and cook stirring constantly until softened. Add the clam juice and bring to a simmer. Stir in the rice and simmer breaking up the rice and stirring constantly until rice is tender and clam juice is almost absorbed (about 2 minutes). 4. Stir in almond milk mixture, clam meat and scallions (reserve some for garnish) to the saucepan. Stir to dissolve miso completely. Add black pepper to taste. Simmer stirring constantly until the liquid is almost absorbed (2-3 minutes). 5. Transfer the risotto into 2 serving ramekins (I used 24 oz.) evenly. Make a well in the center of each risotto and crack in the egg (1 egg for each). Bake in preheated 450 degrees F oven for 8-10 minutes until egg whites are set yet yolks are still soft or your desired doneness of the eggs. Top with some scallions for garnish. Tips: If you like, sprinkle with shichimi togarashi or crushed red pepper over the top.